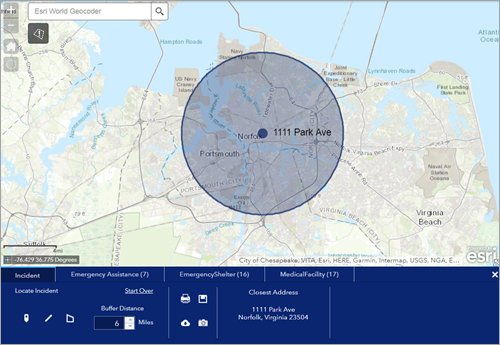 The Situation Awareness widget allows you to specify a location on a map and analyze information from feature layers within the specified area. Feature collections (such as CSV files, shapefiles, and map notes that can be added as feature collections) are not supported in this version of the widget. Optionally click the Change widget icon button and replace the icon with an image of your own. On the Analysis tab, click Add Tab. You can optionally round or truncate the numeric fields with specified number of decimal places by clicking the Edit button under Actions for each summary field. If you choose the Grouped Counts option, Group By Field is required. Click the Edit button under Actions to define Group By Field. Optionally specify a label for each tab. Click the Edit button under Actions to specify the fields to include in the analysis in the Select Fields window. Optionally check Display feature count to add a count to each tab in the panel. Optionally change the order of the tabs or delete a tab under Actions. Tab label—A label for the tab in the widget. Area of interest label—A label for the area under the tab. Buffer label—An optional label for the buffer distance. Minimum buffer distance—The minimum distance allowed to buffer. Default buffer distance—The buffer distance set by default. Maximum buffer distance—The maximum distance allowed to buffer. Distance units—The units used for proximity and closest feature analyses, as well as when providing a buffer distance for analysis. Closest feature maximum distance—The maximum distance to use when searching for the closest feature. Draw geodesic shape—Enable drawing area of interest (AOI) in geodesic shape; checking this option will calculate buffer using geodesic calculation as well. Enable routing—Enable routing from the location to the feature. The Directions widget is also required to generate routes. Disable layer visibility management—Avoid automated control of layer visibility for the layers used by the widget. When this option is enabled, the layer visibility will not be altered when the widget is turned on. Display summary features—Display the map features for a tab that uses a summary analysis. The weather option is no longer available in the Situation Awareness widget. Choose the data output settings and report settings on the Output tab. Under Data Output Settings, check the Enable Save check box to allow the addition or deletion of features from the feature service. Check Save points, Save lines, or Save polygons, and specify the layer for the selected type. The feature service must be editable for this option to function. The Export all fields option, which includes all fields in the layer when exporting to a CSV file, is checked by default. To only include the fields configured in the Select Fields window for summary, grouped counts, or proximity analyses, uncheck this check box. Under Report Settings, check the Enable report check box to create a report of the map and summarized information from the configured tabs. Optionally click the image button to specify a logo image for the report. You can also provide text to be displayed in the footnote of the report, or choose a color for the column headers. The printed report will contain a map and a series of tables displaying the analysis results. Fields that are visible in the layer’s pop-up are the fields reflected in the detailed information table for each tab. Click the Situation Awareness widget button to open it. The widget displays at the bottom of the map. When the widget opens, visibility is turned off for all map layers that have been configured as source layers for the widget unless Disable layer visibility management was enabled. The layers become visible when used by the widget. When the widget is turned off, layer visibility returns to its original state. The Incident tab is selected by default. Click an existing feature to show its pop-up. Then click the more information button to see a list of feature actions, and choose Set Location. 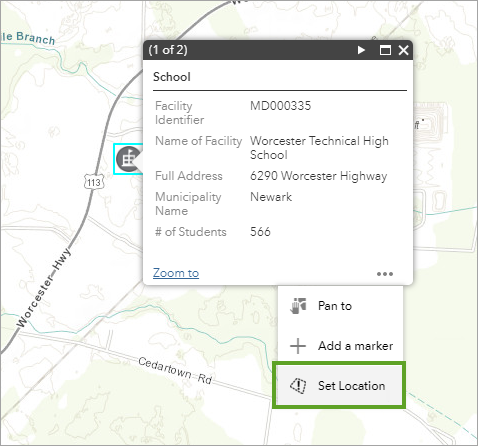 Use the drawing tools on the widget's Incident tab to create a location to analyze. Optionally specify a buffer distance to the location. To download the summarized information, click the Download all button . To save the location to the feature service, click Save . 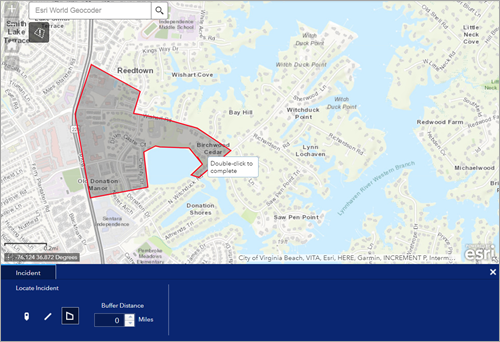 To create a snapshot of the location and analyzed information, click the Create snapshot button . To create a report of the location and analyzed information, click the Create report button . To see map features in the generated report, use the Disable layer visibility management configuration setting and enable or disable appropriate layer visibility using other widgets such as the Layer List widget before generating the report. Click the individual Layer tabs to view the analyzed information for specified layers. You can scroll the widget panel horizontally to view additional results. Optionally click Download to download analyzed data as a CSV file. Optionally, if routing is enabled and the Directions widget has been added to the app's header controller, click the Directions button to get directions from the incident to the feature. For line and polygon incidents, specify an appropriate starting point directly in the Directions widget. The directions button can be found in the tab of the widget. To clear the active location, click the Start Over button. Click the close button in the upper right corner of the widget.